This is a welcome effort by Democratic leaders to rebuke one of their own, but let’s not pretend Omar isn’t getting a speaking gig at the convention next year. Or that she won’t get a standing O from the crowd when she walks out. Silver lining for Pelosi: The Omar word vomit that she’s trying to clean up today has distracted people momentarily from the Ocasio-Cortez word vomit of last week. The “new Democrats” aren’t dull, whatever else they may be. Why should Omar apologize when she clearly said what she actually believes? She should call Pelosi’s bluff and double down. What’s the worst that can happen? The GOP’s in a strong position to make that demand at the moment, having just stripped Steve King of his committee assignments for his latest flirtation with white nationalism. I’m uneasy with the idea of an elected representative being stripped of meaningful power in Congress over their views, however loathsome. Their constituents can always punish them in the next election, right? And the King/Omar precedent could be used to unjustly sanction members with unpopular but more meritorious views in future Congresses. There’s no denying that it’s a meaningful penalty, though — much more so than censure, which is embarrassing but otherwise ineffectual. Take a member’s committee assignments away and you’re stripping their district of influence over policy. If only for reasons of self-interest, the voters of that district should be looking around for a new rep next election. 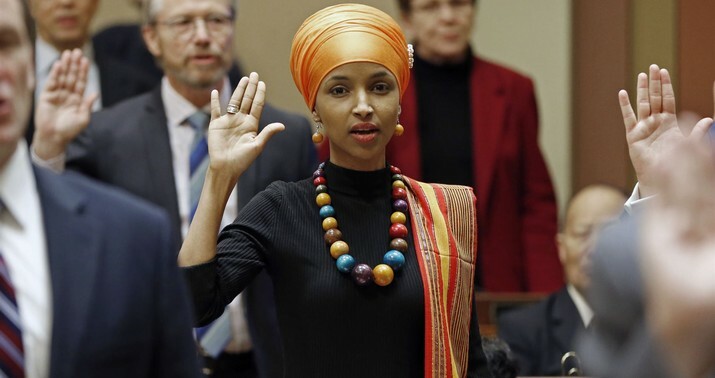 Having Omar questioning witnesses on the Foreign Affairs Committee might prove more useful to Republicans than Democrats, frankly. She’s bound to say something at a hearing that’s attack-ad-worthy. Scalise doesn’t want a soundbite of her innocently wondering into a mic whether Israel has “hypnotized” the world to use against the Dem nominee in 2020? So exhausting that they can’t just say the quiet part loud. The Party prices in the anti-semitism of someone like Omar. It’s worth it to them for what she brings to the coalition. They are just annoyed they have to police her so often. And yes, mutatis mutandis for the GOP. CNN asked Omar about criticism of her views on Israel a few days ago and she knew exactly what to say: “I think it is actually exciting because we are finally able to have conversations that we weren’t really willing to.” That’s identical to how an alt-righter would defend Steve King’s point of view. All we’re doing is opening up the conversation to new viewpoints. She’ll get cover from the grassroots left for just that reason, even the ones who don’t share her antipathy to Israel. (Assuming there are any such leftists.) “It’s time for bold out-of-the-box thinking on policy” is an ethic they’re eager to instill in the electorate, and Omar is delivering that in her own special way. How can she back down now by apologizing? Eliot Engel, the chairman of the Foreign Affairs Committee, put out a statement earlier criticizing her tweets from last night but saying nothing about removing her from the committee. Stay tuned. Update: Good point here. Maybe Omar has already doubled down. So Pelosi spoke with Omar, and then put out a statement calling on her to apologize. One would think an apology was broached in that conversation — and they wouldn't have called for it if Omar was ready to deliver one. Update: Ah, someday I’ll learn not to doubt Pelosi. “I shouldn’t have implied that AIPAC money is behind America’s support for Israel, but no, really, keep your eye on AIPAC.” That ought to put this to bed until the next time Omar pops off about Israel. Over/under is three weeks from now. Exit question: Does she see any “problematic” lobbyists on the left?